This Boice Crane 14" Band Saw has given most excellent service to many thousands of users. It has served faithfully, dependably and profitably on all sorts of difficult sawing. In lumber yards, mills, industrial woodworking plants, boat yards, pattern shops, foundries, and home shops. Sawing thick 7·inch wood is quite within the scope of this machine. Likewise you can saw metals, such as brass, copper, iron, metal lath, or composition board, cork, meat, paper. dry-ice, cardboard. etc. On regular sawing, using 3/16" to 1/2" wide blades, a Boice-Crane 14" Band Saw will compare in performance with mill·sized machines. In addition as it operates with so little friction. it will handle much narrower blades for very intricate design sawing. Blades as narrow as 3/64 of an inch in width (Veri-Thin Blades) may be used. In any of this work, a band saw needs the exceptional strength and weight that is built into Boice-Crane Band Saws. The great strength in the frame means no vibration. As proved in actual use, the blades will run for weeks at a time without retracking the wheels, or re·adjusting the guides. and without any tendency of the blade to run off. The wheels are very large in diameter, so their gentle curvature causes no strain on the blade and that means long blade life. The Boice-Crane 14" Band Saw will cut 7 1/4" thick material without any insert in frame, which is 1" deeper than the normal capacity of most other 14" band saws. It will cut to the center of a 28" piece. Capacity larger than that is very seldom. if ever. required by small shops or home craftsmen. 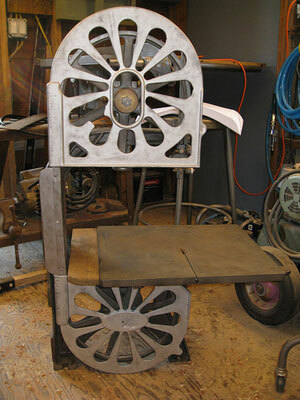 To saw material thicker than 71/2 inches on a band saw requires a motor more powerful than 1/2 horsepower. For that reason, the Boice Crane 14" Band Saw has been intentionally built to saw only up to 7 1/4 inch thick material, and no thicker. That is the thickest material that can be sawed satisfactorily by a 1/2 h. p. motor connected to an ordinary electric-light socket in the home or small shop. the very infrequent need in the home shop, for such thicker sawing, the expense for the special wiring is not warranted. On the other hand, if you have the capacity, and you do without that wiring, you can't saw such thicker stock for lack of power-hence a deeper cutting capacity in band saw is of questionable value to home shops. In other words, the Boice Crane 14" Band Saw is exactly suitable for homeshop and for every woodworking plant. which has ordinary lamp-socket current available. Buy an efficient. smooth running 14" Boice.Crane band saw. At our sensationally low price, you save a lot of money. Boice-Crane wheel guards are made entirely of soft aluminum. This soft metal on contact with a blade will merely dull the teeth. Even if a blade breaks and strikes against the aluminum, the blade can be reclaimed for further use. by brazing and sharpening, at very small cost. One or two blades reclaimed in this way will more than pay for the slight extra cost of Boice.Crane Aluminum Wheel Guards. Both upper and lower halves of the guard, are fastened together and hinged on the left side. Both open quickly, like a door. for ease in changing blades, and close as quickly. No time is wasted in slowly unscrewing each half of guard separately and slowly replacing each. The excellent ronstruction of this band saw, its steady running qualities. 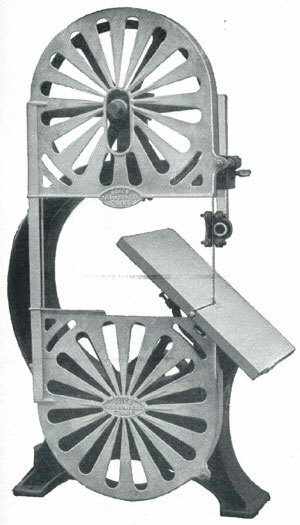 together with its exceptionally low price, all make this Boice-Crane 14" Band Saw the best band saw value for 1936. It costs but a trifle more than 10" or 12" band saws and far less than any other 14" band saw. Insist on a Boice·Crane.